I'll remove some non-existent debt and hang onto the card. At least we know what it does, now. Hank just took on some Debt, although you wouldn't have been aware of the Agency Secrets effect at the time. Seems like, knowing what you knew, you'd probably have opted to use Jenny's power to cancel the Debt, but I'm fine with however you want to resolve it. Yeah, technically Hank went first so we probably would have just had Jenny cancel it out right away before my turn came up. Canceling that debt is fine. What's the difference between incantation and ritual spells? Because I might move to Buenos Aires to see if I can do an encounter there. Don't know what would be most useful. I could get to 17 but I don't think I can get to Himalayas. Mogri laid out a way you could upthread. I think going for the expedition is the best move. I wouldn’t stress about it too much. Still pretty early. Aw ok. Then I'll change grabbing a ticket to moving to Shanghai, planning to do the expedition next turn. Up to you on how best to prepare on your end. Say, is the additonal title of this thread supposed to be Globetrotting Great Old Ones? Torzelbaum. Look. They're no spring chickens for sure, but that's just rude. Anyway, False is right -- he can't make it to the Himalayas this turn. Private Care (2) - Service: When you gain this card, immediately recover all Health and Sanity. Then discard this card. 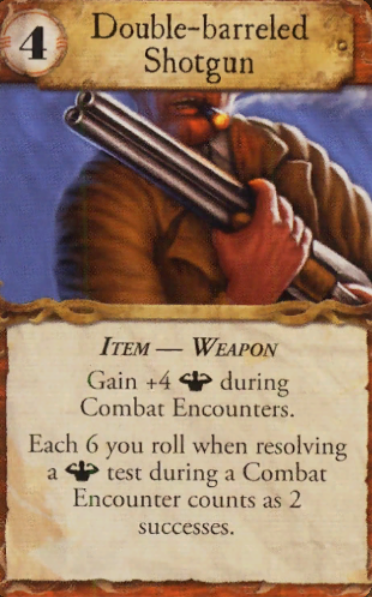 Whiskey (1) - Item: You may discard this card to prevent an investigator on your space from losing up to 2 Sanity. The Whiskey is the only asset you could get with your passive, and it's not fantastic. But! Good news! I just realized I was using the reference card for two players. You should've been getting two clues every time we spawned a clue. (The bad news is that you'll get two monsters at each gate when Monster Surges come around.) So I've added clues at 11 and 15. You can reach 15 by special-actioning to Istanbul then traveling to 17 and using your sea ticket, and that would leave you with the special action's bonus action. If collecting clues isn't your style, you might head in the direction of San Fransisco. SF specializes in improving your Observation -- as you well know -- and bumping that up would improve your passive ability. The shortest way there looks like Pyramids -> 10 -> 8 -> 7 -> SF, though there might be a quicker way with your trainhopping power. You also reminded me that I forgot to list Jenny's and your sea tickets among your assets. I will rectify that in the next round. I suppose I will get the clue at 15. But I think that leaves me with no moves. Pyramid to Istanbul = normal move. Istanbul to 17 = special movie. 17 to 15 = sea ticket. Get clue in the encounter phase. Your special action gives you an extra action. If you use your special action first, then you can spend an action in Istanbul before leaving. If nothing else, you can grab a travel ticket for a future round. Can you grab a ticket despite not starting in a city? The rules in the OP made it sound like you had to that before you started moving. If not then I'll happily grab a train ticket on the way. Component Action: Use Pete's special action to move from The Pyramids to Istanbul. Bonus Action - Prepare for Travel: Now that Pete is in Istanbul, he can take a train ticket. Travel action: Pete moves from Istanbul to 17 then uses his sea ticket to continue to 15. It's confusing for sure, especially since Pete's special action is a movement that counts as a Component Action instead of Travel. 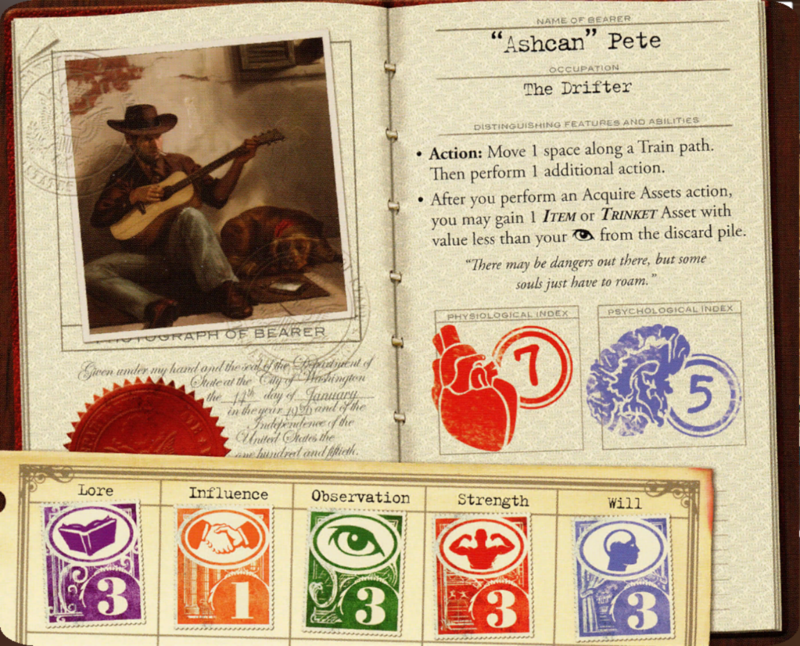 Incidentally, since that's the case, you can't use sea/train tickets to extend Pete's special movement -- they only work when you are actually using Travel. IIRC, this means that the sequence of events you used in the first round isn't legal, but I didn't object because there was a legal sequence to accomplish the same results. Incantations differ from other spells in the sense that [they] must be invoked by the player, but don't require an action to perform. 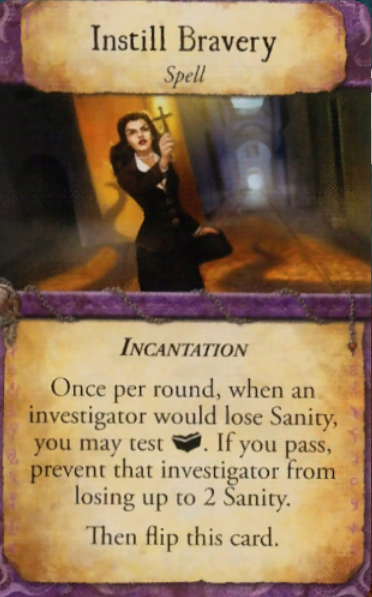 Some incantations can also be invoked on another player's turn, for that player to gain the benefit of the spell. A Ritual spell differs from other spells in that they require an action to perform, and usually involve a Lore test in order to gain their power. Acquire Assets+ - Rolling 6d6 for (1,1,2,2,4,5) -> 2 successes (oof). So let's go ahead and pick up that Forbidden Tome. Hank grabbed that already. Fancy some Whiskey? Or a loan, maybe? If you acquire as your first action, you can work off the loan as your second. Sorry, what is the preferred term now - Great Here Long Before Your Pitiful Race Ever Even Existed Ones? "Great Ones of Advanced Age." Bodyguard (2) - Ally: Gain +1 Strength. Reduce the damage of Monsters you encounter by 1 to a minimum of 1. 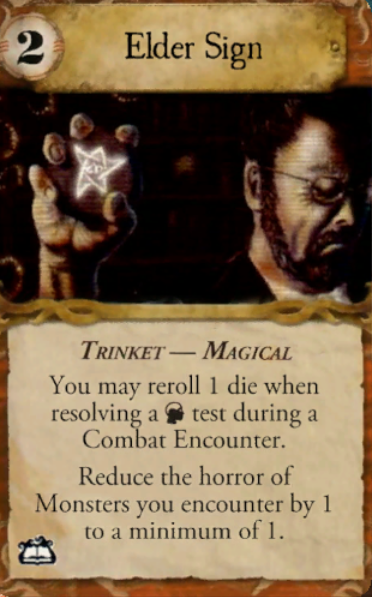 Patrolling the Streets (1) - Task: When you defeat a Monster with toughness 3 or more during a Combat Encounter, you may discard this card to retreat Doom by 1. A collector of occult texts is inside the exclusive Shanghai Club. You try to enter. Test Influence. If you pass, he gladly loans you a book; gain 1 random Tome Asset from the deck. If you fail, you are arrested for trespassing; gain a Detained condition. Pretty nice book! The top gate is Antarctica (blue symbol). A night watchman tells you that a crate of weapons has "gone missing" from his warehouse. You offer him some money to learn more. Test Influence. If you pass, he sends you to an alley; gain 1 random Weapon Asset from the deck. If you fail, he sends you into a trap; lose 1 Health and gain a Leg Injury condition. Oh snap. The doctor will see you now. A sailor at the Rope and Anchor in Kingsport provides his help. Gain 1 non-Ritual spell. You offer what pay you can. Test Influence. If you pass, he thanks you; gain 1 random Magical Asset from the deck. If you wail, he mutters arcane words that disturb you; lose 2 Sanity. 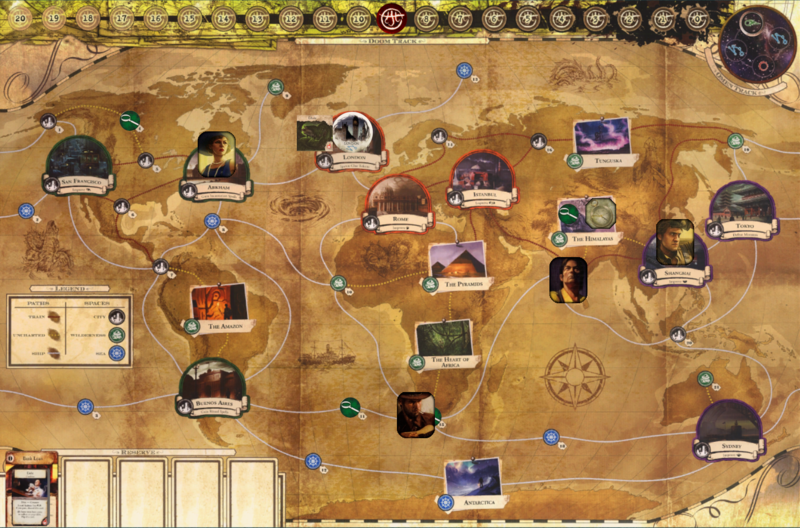 Elder Signs were a big deal in Arkham Horror, effectively equivalent to five clues. Here? It's a nice bonus, I guess. You are convinced that ingesting a small amount of venom will make you stronger. Test Will (-1). If you pass, after a period of brief sickness, you feel strengthened by the poison; gain this Clue and improve 1 skill of your choice. If you fail, one of your friends slips into a coma from the poison; discard 1 Ally Asset. Lucky for Duke, Pete's completely crazy idea bears fruit! Which skill will you increase? You've got 3s across the board aside from Influence. Everyone's a winner to some degree or another. There's only one choice to make, so when Pete decides on a skill, we'll proceed to Mythos. The Omen tracker moves to blue. There's one open blue gate, so Doom advances by 1. 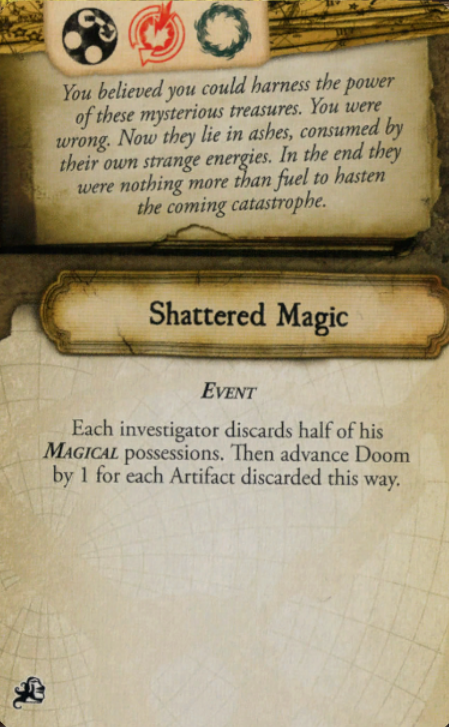 Reckonings are always resolved in this order: monsters, ancient one, ongoing mythos cards, and investigators' junk (starting with the lead investigator). Dhole: Dhole moves to Arkham. Jenny loses 1 Health and 1 Sanity. Atlach-Nacha: Spawn 1 Gate unless investigators as a group discard a total of two Clues and/or Spells. You'll need to decide if you're going to counter Atlach-Nacha's Reckoning effect before we can resolve this. Because of the Otherworld Codex, you know that the first gate will appear in Antarctica. Since Eye of the Storm has you potentially one turn from defeat, you may want to let both gates spawn. Jenny can get to London, but she's not guaranteed to close the London gate, and she's rather unlikely to resolve the Rumor there with her poor Observation. Among the four of you, you have all of an Elder Sign that counts as Magical. So that's gone, but it's a pretty light price to pay considering what some of the Mythos cards can do. Choose how to handle the gate situation before we proceed. Remember, each new gate comes with a monster. Yeah, I think probably best to let the spider open a damn gate. I have two clues myself and so can keep the second gate from opening? Yes - it's a question of whether you want to. 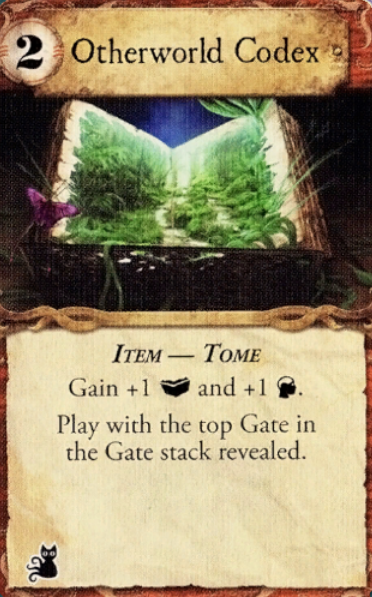 But even if you do decide to prevent the gate from spawning, you might prefer to discard a clue and a spell or two spells. I could give up my spell, though I think it would be possible for me to get some use out of it. I think I'm leaning toward just letting the gates open. But we'll definitely have to get on top of closing them. Closing gates is the only way to keep the rumor from killing us (as long as the closer has some clues) so may be safer to have a couple to go after. We could also just get to London as quickly as possible and try to solve it now that the Dhole has moved but Jenny is the only one anywhere near there. My plan was to go artifact hunting next round since I’m next door to the expedition but I’m open to suggestions. Works for me to let the gates spawn. I'm adjacent to the expedition as well; maybe one of us can get the clue and one can do the expedition. Or I can do something else.